With slight decrease of mercury in the city several roadside dry fruit vendors popped up offering a variety of dry fruits. The demand of dry fruits at retail stage is still low; however, sale at wholesale has started picking up. The regular shopkeepers and venders have expressed hope that demand will go up considerably in coming cold days. The prices of dry fruits have gone beyond the reach of the common man. The prices of almond, pistachio, walnut, pine nut, dates, cashew nut, dried apricot, coconut, fig and peanut have increased, said a vendor. The reason behind the increase in prices is said to be decline in the value of local currency during the current year coupled with increase in cost of transportation and coast of doing business. Customers held retailers responsible for pushing up rates artificially and fixing the rate at a higher side. 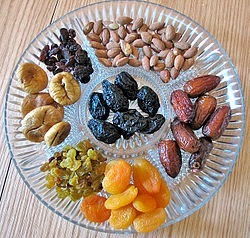 Dry fruits are mainly imported from Afghanistan, Iran, USA and India while substantial variety is also grown locally. Traders also attribute the rise in prices to slow growth in imports and low production in the country and costlier imports. Already overburdened by the unprecedented increase in prices of essential commodities, fast and frequent increase in power, gas tariff, increase in transport fairs and oil etc have very negative impact on purchasing power of general public. They have already stopped purchasing any extra item just to save something to feed their children. During a visit to some of the markets of the dry fruits scribe noted the prices as: almond register increase from Rs 700 to Rs 1100 per kg in wholesale. Chilgoza (pine nuts) as usual remained the most expensive ranging between Rs 2000-3200 per kg with shell and without shell. There is no change in the price of pine nuts as compared to last year. Pistachio with and without shell at Rs 1400 to 1800 per kg, walnut at Rs 500 per kg, Peanuts without shell at Rs 400 perkg and peanut with shell Rs 200 to Rs 320 per kg in the open market.